The theme of the conference, Restoring the Scientific Method, acknowledges the fact that claims of scientific certainty and predictions of climate catastrophes are based on post-normal science, which substitutes claims of consensus for the scientific method. This choice has had terrible consequences for science and society. Abandoning the scientific method led to the Climategate scandal and the errors and abuses of peer review by the Intergovernmental Panel on Climate Change (IPCC). The scientists speaking at this conference, and the hundreds more who are expected to attend, are committed to restoring the scientific method. This means abandoning the failed hypothesis of man-made climate change, and using real science and sound economics to improve our understanding of the planet’s ever-changing climate. For those of you who were lucky enough to have had your head in a vice, thus preventing it from exploding, take a look at the last sentence. The rest you you go clean up that mess. Now tell me how the hell is economics going to improve our understanding of the planet’s climate? Do the ‘fine folks‘ at Heartland even know what economics is? Doesn’t look like it. The event is open to the public. Federal and state elected officials can attend for free. Well that will ensure that politics doesn’t interfere with science. Unless of course that is exactly what they want. Because science certainly hasn’t given them the ‘right’ answer. [UPDATE: It looks like I am a victim of Poe’s law, which states that “Without a winking smiley or other blatant display of humor, it is impossible to create a parody of fundamentalism that someone won’t mistake for the real thing.” It turns out that the “warning” paragraph above was a brilliant piece of satire written by John Nielsen-Gammon (whose blog you should all read), to make this clear I added a /satire tag at the end. Though everything else I quoted was written by the Heartland Institute. 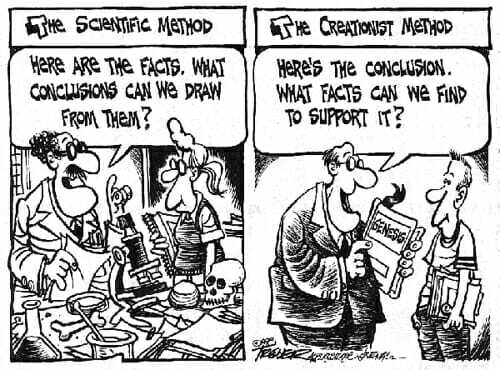 And that, my friends, is what the scientific method looks like… if you are an anti-science idealogue who must, at all costs, deny climate change. By attending this conference to restore the scientific method, you must forever abandon any such methods. And what about those supposed “claims of scientific certainty“? Well Heartland is absolutely sure that the climate is NOT changing, and that the thousands of respectable scientists are all conspiring against your SUV! Otherwise why would they threaten legal action for not being “committed to abandoning the theory of man-made climate change“. Don’t you dare keep an open mind! Not even a little. And ignore the overwhelming consensus of both experts and evidence pointing to the fact that yes, humans can and are changing the climate. Certainty doesn’t get any stronger than that! Also I doubt that the Heartland Institute needs any help doing “irreparable harm to [their] credibility and reputation“. They are doing more than fine in that regard on their own. Of course this would all be hilarious if a) the stakes weren’t so astronomically large and b) important policy makers didn’t take Heartland’s nonsense seriously. So instead of a comedy we are all (yes even the people at Heartland) forced into a tragedy.